Evolving software systems requires their preliminary analysis and assessment. In particular, information on the performance and costs of software system components must be gathered for identifying the most appropriate strategy for their evolution. A critical point is finding suitable data gathering means to effectively support the decision makers. This paper presents a strategy composed of a methodological approach and supporting toolkit to help maintainers in the evolution process. The strategy integrates measurement and decision-making tools, and critiquing techniques. It analyzes software systems and identifies a set of alternative evolution approaches by mapping critiques to specific innovation actions. The proposed strategy is validated by case studies conducted with a major software enterprise and Public Administration. 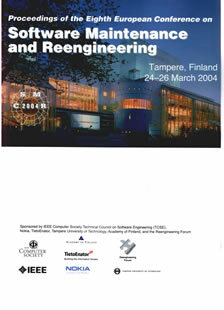 The Eighth European Conference on Software Maintenance and Reengineering (CSMR 2004) is the premier European forum for discussion on the theory and practice of evolution, maintenance, and reengineering of software systems. The theme of this year’s conference is “Maintenance and Evolution of the Software Architecture.” Nowadays the importance of designing a robust software architecture is well understood by practitioners as a key enabler for successful software systems; however, the maintenance of its integrity and efficiency over the time and its evolution to address the new requirements are rather immature and unsystematic. We have solicited contributions on this theme. The technical program of CSMR 2004 covers a wide range of ongoing research activities in the area of software maintenance, reengineering, and software evolution. Keynote presentations and technical presentations are the core of the program. Specifically, the technical presentations are in the area of software maintenance, architecture design recovery, software evolution, reverse engineering, web applications, dynamic analysis, historical analysis, product families and experience reports. In addition, there is a separate session on tool demonstration whose goal is to gather together the state of art in tools for software maintenance and reengineering.